Arthritis in the wrist is common, and can be either a hereditary or the consequence of an old injury. Wrist arthritis is treated by Dr. Peter G. Fitzgibbons, MD at The Centers for Advanced Orthopaedics: Maryland Orthopedic Specialists Division. Dr. Fitzgibbons performed fellowship-training in hand, wrist, and elbow surgery through the Harvard Hand & Upper Extremity Fellowship based at Brigham & Women’s Hospital in Boston. 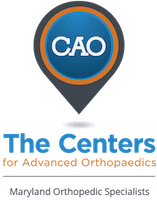 With office locations in both Germantown and Bethesda, Maryland, he and a team of orthopaedists, hand therapists, and physical therapists offer a comprehensive range of services covering the diagnosis and treatment of arthritis in the wrist. Arthritis is pain and swelling in a joint, typically caused by loss of the cartilage that lines the joint. Osteoarthritis is the most common form, and while it causes is still not entirely understood, it is likely largely genetic in origin. Inflammatory arthritis, the most common being rheumatoid arthritis, usually has an underlying auto-immune component that can often be treated with medications. In the wrist, arthritis is often the result of old ligament injuries that have allowed bones to rub against each other in an abnormal way for years. How is wrist arthritis treated? no longer there. Arthritis of the wrist is a good example of a condition where extensive communication is necessary between the physician and the patient. Choosing the right way forward is a function of many different factors, and an individual’s goals and preferences play a large part in making that decision. Dr. Fitzgibbons works hard to ensure that patients understand all of the issues involved and make a decision that is right for them. What is surgery for wrist arthritis like? Surgery for wrist arthritis is usually outpatient and is done with general anesthesia. Dr. Fitzgibbons performs most of these procedures at the Massachusetts Avenue Surgery Center, an outpatient surgery center that provides a safe, patient-oriented experience in a friendly and comfortable environment.